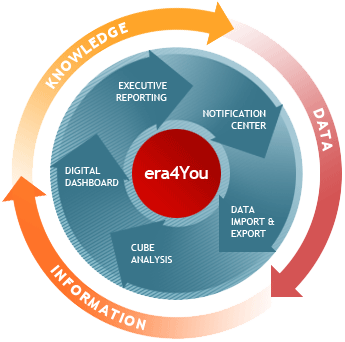 era4You (Enterprise Reporting and Analysis) is the online Business Intelligence Solution that transforms your enterprise-wide data into knowledge for effective measurement and management – contributing to better business decisions. 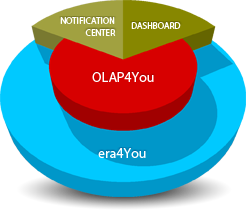 era4You was designed to bridge the gap between OLAP engines, information distribution tools and dashboard applications, offering the user the unique experience of an integrated business intelligence application suite. The huge advantage of bringing together all business intelligence features is that it makes them available to employees, business partners, and customers into a secure, centralized application environment. Information consumers can personalize their workspace so they receive tailored information for use in their day-to-day activities. Bringing together all BI modules within era4You reflects on the administrative side too. The Control Panel offers an integrated administrative console for creating, updating, deleting and managing all era4You resources. “I feel privileged to write a reference letter for K4Y in regard to both its methodological approach and the quality of its consultants. Reporting raw data and performing in-depth analysis enable information consumers to seamlessly gain insights into their business using the existing information assets and drive breakthrough performance anywhere, anytime. Built on advanced OLAP technology, the reporting and analysis module is the core of the era4You suite. It is also available as a separate product, the OLAP engine provides powerful ad-hoc and scheduled reporting capabilities to generate meaningful information. Following the business logic, era4You cubes are configured using “snow-flake” hierarchies for data presentation which allow users to group and filter data, transforming it into meaningful information. Exceptional performance and functionality are achieved through ad-hoc query and analysis capabilities, which empower the users to drill-down and up through data, slicing and dicing it to the desired level of detail. Calculated columns to support “what if” scenarios. Data can be grouped according to the criteria defined by the user, can be looked at from various angles, and can serve as basis for reports with different degrees of detail. The final reports can be formatted in a variety of ways, can be saved for later reference, and can be distributed to different groups. © Copyright © 1999 - 2019, All rights reserved.